Pascal Ellinas and Dave Pearce’s dance tracks and remixes have been nominated for three SAMAs. They’ve shared stages with the likes of DJ Tiesto. Dave was the groom’s wingman on his big day AND in fitting style. 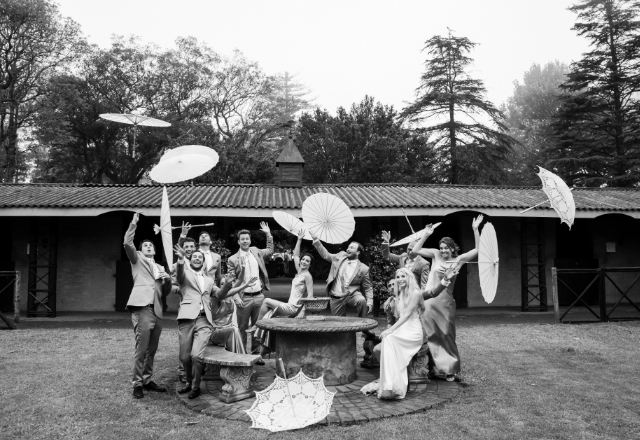 The venue was Backworth Stud in KZN Midlands, co-owned by the bride’s uncle and godfather. A special haven to Sarah since she was a child, today she’s an attorney of The Western Cape High Court with a taste for the simple and elegant – as she told her designer Jacques Lagrange. The couple visit this nineteen twenties era farm at every chance they get and wanting to be wed out in nature and where no one has been married before, this was their first choice. Wreaths of greenery and fynbos hung over this English garden of a venue with vintage vases on raw wooden tables. Quite a setting for Andrew Draper to work HIS magic. Pascal’s bride had [again thought outside the box], opted for parasols instead of bouquets and made her brothers her ‘men of honour’. The couple would exchange rings inscribed with their grandparents’ initials and the ceremony involved friends and family speaking - including Jenny Ellinas, Pascal’s mother and Ivor Pietersen, Sarah’s brother. Amongst the hundred or so guests were artists who Pascal and Dave have mixed tracks for, like the Locnville twins. A theme running through the day was that of guests marvelling at these two originals they call friends. Pascal is the soccer playing, business management graduate who went into music. Sarah is the psychology post grad who ran her own recruitment company whilst studying her LLB - making Greg Pietersen the proudest of fathers. John Kruger and Melissa Chaplin played live and there would be no less than six DJ’s on the decks that night. There was every chance of that, at the wedding of a man who mixes for acts like Goldfish and Flash Republic. On a farm the music could and did play ‘til 4 a.m. A honeymoon in The Maldives awaited and here’s to a party that lasts a lifetime. sms SP806 to 36697 to vote for Sarah Pietersen!